DRAM ICs are often installed from the latest batches in the DRAM module series of many manufacturers. The result: You have to obtain new releases regularly and at short intervals. Save yourself from this expensive process in future by using DRAM modules! In cooperation with our partners, we have incorporated DRAM modules with extraordinarily long-term availability into our programme. DRAM ICs from ISSI are installed on the DRAM modules from Xmore®. The manufacturer is characterised by the extremely long availability of its DRAM ICs: on average approx. 7 years and more without a “DIE change”. DRAM ICs from ISSI also offer exceptional quality. All DRAM modules are available in an industrial temperature range from -40 to 85 °C. With this, we offer a robust solution that can be deployed in even the harshest conditions. 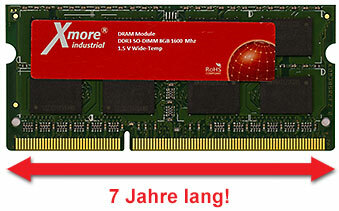 DRAM from Xmore® industrial – the safe and long-term solution for all industrial customers! Use the highest quality and meet your clients’ highest demands! DDR3 SO-DIMM modules are available in capacities from 2 to 8 GB at 1600 MHz. Low-power editions are also available. Other varieties and designs are available on request.